MANILA, Philippines - Eight member schools of the University Athletic Association of the Philippines (UAAP) battle for supremacy in the Season 78 cheerdance competition (CDC) at the Mall of Asia Arena in Pasay City today, October 3, 2015. UAAP broadcast partner ABS-CBN Sports + Action Channel 23 will bring the live actions as the country’s top cheerleaders show their school spirit. 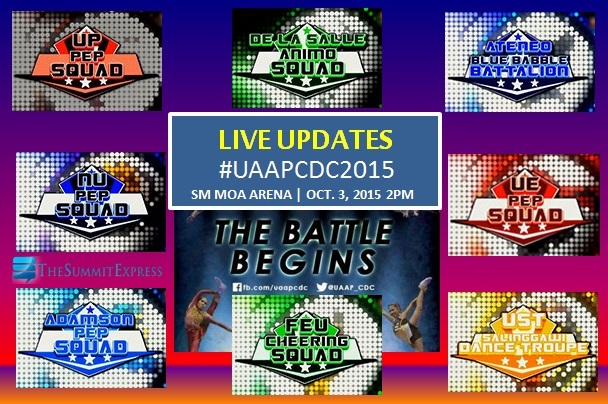 #UAAPCDC2015 livestream feed will available on ABS-CBN Sports portal. Catch the live updates of this momentous event here. The National University Pep Squad was hailed as champions in the 2014 cheerdance competition after a perfect run that saw them pull off complicated stunts and entertaining dance numbers while wearing costumes inspired by Native American garb. The UP Pep Squad finished with second place after their aim to reclaim the throne fell short. UP has their theme of "equality" that saw them use rainbow-colored pompoms, while inspiring awe when their female cheerleaders flipped the script by lifting the male cheerleaders during their stunts.